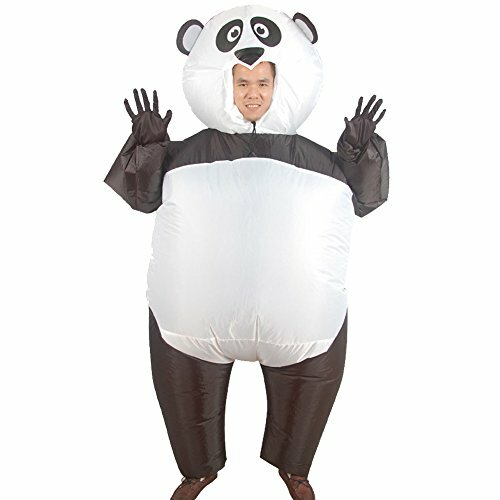 Then the H&ZY inflatable Halloween costumes for adults are perfect for you! And no need to worry about sweating in the costume! It's perfectly ventilated so you can party on! But if for any reason you are not completely satisfied with the costume, we will give you your back -just let us know, we'll be happy to help you out! BE THE WINNER OF EVERY COSTUME CONTEST: Get ready for this year's Halloween with these truly unique and hilarious inflatable costumes. Choose one of the 9 original designs and win every costume contest! Dress up as a big ballerina, a dragon, ostrich, gorilla, t-rex or unicorn rider, a cowboy or a sumo wrestler, and draw everyone's attention on you! Gives the illusion of an animal giving you a piggyback ride! Perfect for Christmas, Halloween, Cosplay,Oktoberfest, Charity Fun Runs or just an ordinary day! Requires 4 x AA Batteries (not included); It must be 23 AA batteries or it will not be powerful enough to fully inflate the costume. Please tighten the outer ring to hold the fan in place before putting on the costume, in case the ring becomes loose during shippment then the fan would fall out; If the costume can't be fully inflated, pls loosen the ring and turn the fan towards the front to better inflate the head, also, tighten the drawstrings as tight as possible. If you have any questions about this product by H&ZY, contact us by completing and submitting the form below. If you are looking for a specif part number, please include it with your message.